The Half-Dipper: Lam Kie Yuen "Chennian Gongpin Pu'er"
Lam Kie Yuen "Chennian Gongpin Pu'er"
I'm afraid that I have absolutely no idea which generous soul sent this to me, but handwriting analysis (me squinting at the writing) suggests that it may be Peter of Pu-erh.sk. Whoever you were: thank you very much indeed, and apologies for neglecting to record your identity! Drinking shengpu-shupu mixtures is very good practice for differentiating the two; I seem to have encountered such blends rather frequently of late, sometimes provided without telling me the contents as a cheeky challenge. Most often, it is the character in the mouth, and ultimately the appearance of the wet leaves, that makes this a little more easy. However, as pictured below, the dry leaves sometimes give hints: here, although perhaps obfuscated by my camera's colour balance, the leaves are two-tone, with some being nearly black, and some being husky chocolate-brown. Happily, the aroma is humid, dank, and everything that the phrase "wet library" entails, with glorious effect. The initial scent in the wenxiangbei [aroma cup] indicates the presence of shupu, with its powdery rubber tang that sits in the nose. I mean that in a good way. In the mouth, it becomes more obvious: the shupu is evident in the initial attack of the tea at the front of the mouth: the shupu powder-and-rubber is a highly volatile compound that seems to fill the mouth immediately. 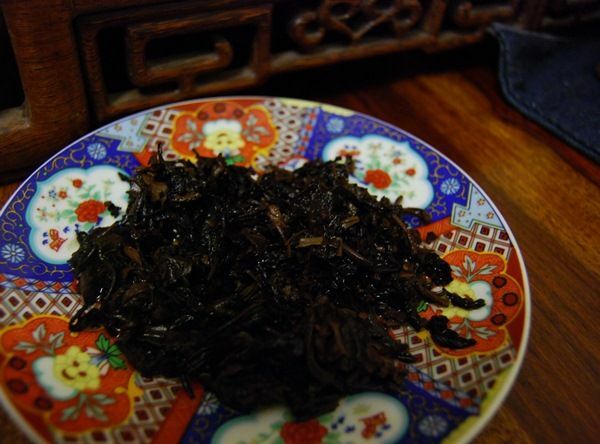 However, the presence of shengpu then becomes more clear as the tea moves to the throat: it has a really rather massive cooling sensation, which I have never encountered to any degree in shupu (even "gushu shupu", sacrilege though it is to compost/wodui one's gushu leaves). 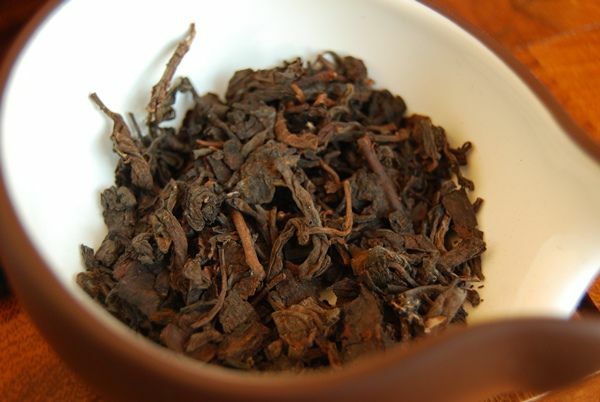 While there is huigan as such, the mixture of shupu with some real shengpu backbone is very pleasant. Another indicator that this tea (which is a maocha, more or less) has some age is from the appearance in the cup: it has a separated-out meniscus (pictured below), a.k.a. a "golden ring", much like an older wine that has been allowed to age gently. Whereas lesser leaves would call it a day and pack up quite quickly, this tea managed to go some two dozen infusions, while I caught up with writing my journal. The infusions lengthened significantly after the first dozen, but the cooling, sweet, bookish character continued to charm until the end. Turning out the wet leaves, the two-tone mixture becomes more obvious, where we can see that the shupu component predominates, as shown below. Lam Kie Yuen sells this for a very reasonable HK$150 / 150g, which is around US$16. For such a price, a little purchase would definitely be in order for some easy and straightforward, yet pleasant, drinking. As we look back on 2012, such as the date requires, we often think about all of the blessings that have come and gone, and of those events that we would have liked to gone differently. 2012 was my "Dragon Year" (being a child of the year-of-the-dragon), and in it much has happened - most importantly, the arrival of the Little Dragon himself, Xiaolong, who continues to charm us with his easy-going manner and calm humour. Who knows what 2013 will bring - it is a year that could promise much, and suggests that it is probably time that I checked in with the Yijing, as is my habit. For the Half-Dipper, it has been a good year, for which we must thank you, Gentle Reader. Visits have slowly been climbing since the start of this humble little site, with the 2011 average of approximately 400 views / day increasing to around 550 views / day in 2012. For such a strange web-site, I'm genuinely surprised (and very pleased) that there are quite so many readers of equally strange temperament to its author. Equally bizarrely, the most popular article by far (with 1,200 views in one day) was a post in which I recommended a rather humble, but very enjoyable, box of minor-label cakes. I wish you, Gentle Reader, the very best of wishes for 2013, and look forward to sharing tea with you in whichever format we can manage together. did the shu/sheng taste components stay together throughout the session? I had only single shu/sheng mix and it was all shu at the start and then it turned to all sheng (not a good one too), which was pretty strange overall. Best regards and best of luck in 2013! Is there a xiaoshe scheduled? It was from me, I gave you this sample during a tea session when we tried 2010 Dayi 70th Ann., 2011 Jin Dayi, 2003 Jin Dayi, 2010 FuJin 6 Stars and 1997 LauYuFat Wild Green Brick. I think Lam Kie Yuen do their own blending. This is the second best of their house blend and there is one above this. If I remember correctly, please don't quote me for this, the higher blend has more sheng in it. I don't think they use only maocha, very likely there are some broken piece from other cakes. As a tea trader they must have lot and lot of cakes in storage, every time when they move cakes around in storage, very likely there would be some be broken and I guess they would use the broken pieces in their house blend. IMHO, sheng and shu mix only work with aged sheng. Try as you might mixing some shu with young sheng, they just don't blend well togehter and the resulting mixture would taste rather odd. Firstly, I apologise once again for neglecting to record that it was, in fact, Apache who so kindly gave me this sample. It was entirely delicious, and a great way in which to start 2013 - thanks again! I was impressed by its longevity, which made it suitable for a long session (spent intermittently, reading Dr. Seuss books to my son). Secondly, I agree with Apache on the blending of shengpu and shupu: it simply cannot work when young. The characters of the two are so remarkably different that such a blend would be very hard to get right; certainly, I have never even seen it attempted. I know that there are some brave warriors out there (shah8?) who like to mix their own leaves! About all I can manage is the miscellany of my "house blend". 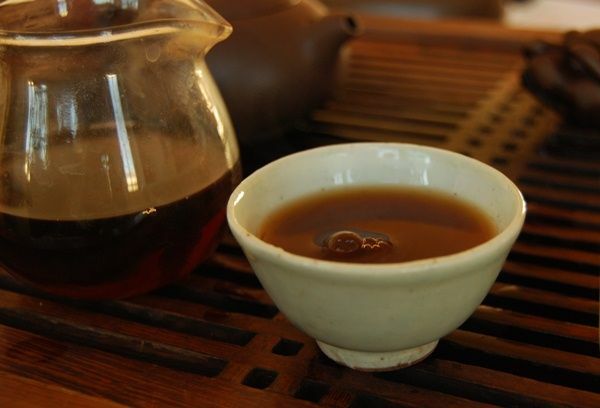 However, when the shengpu is aged, it is much more aligned with the artificially-aged shupu; after all, the purpose of wodui / composting is to approximate the character of aged shengpu. Sometimes, it can be difficult to separate the two components - in this example, though, the shupu is really very shupu, while the shengpu (whatever it is) can be identified as being noticeably more lively and active, including some characteristics in the mouth that are entirely absent from the shupu repertoire. Interesting. Thanks for writing as always. Maybe I'll think about trying a blend like this to learn to discern the different characteristics. On a side note, how do you feel that clay strainer works for you? I use the cheapie all-metal ones, but find the mesh rusts with use. Is the mesh on yours metal or some kind of nylon-type of material? There is no need to apologise and I should say thank you for sampling this and your notes. I admire your tireless efforts to sample anything new whereas I'm just too lazy (more correctly unwilling) to sample things which I don't know, perhaps that's the first sign of aging (no, not aging of pu, but myself!). 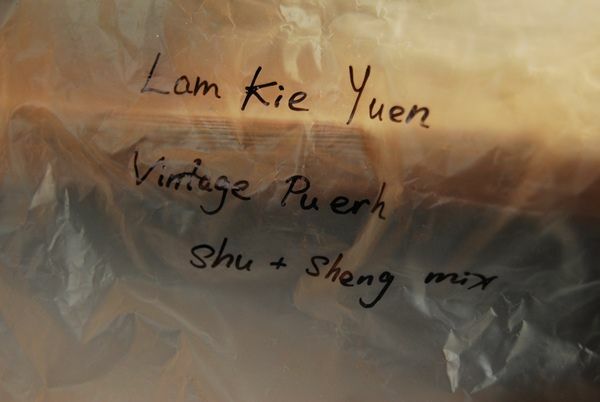 I have drunk pu which is a mixture of shu and young sheng and I didn't do the mixing myself but it was sold as a mix already. Who know, may be there are audiences who like this (Heston Blumenthal's style pu), but as a pu traditionalist, I wouldn't choose to have such a whacky mix. Mixed sheng and shu before. Didn't really work. Mixed two different kinds of shu before, a 7581 and an old lincang shu that's been a mainstay at YS forever. That will work surprisingly well. 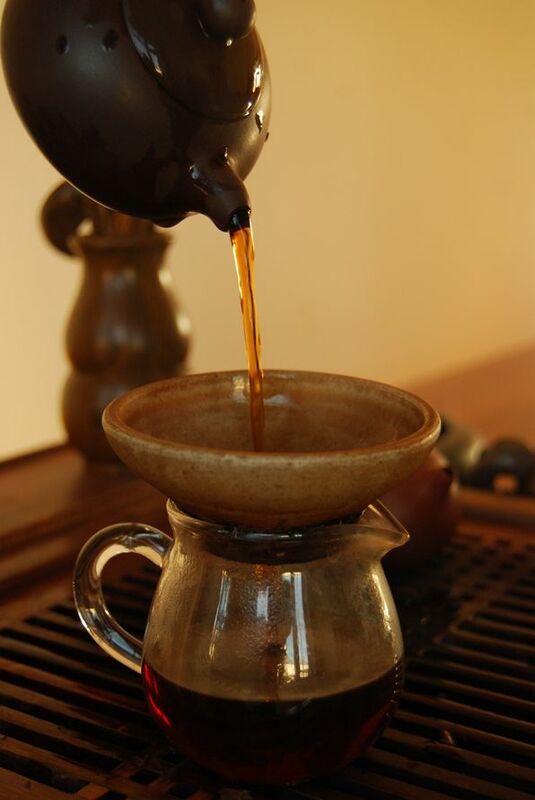 My best guess for those of you wanting to try it at home, I suggest a slightly aged lincang or jingmai sheng with strong floral edges and sweetness, and blend that with an austere earthy shu with a strong taste but not much sweetness. Not too much of the sheng, of course, just enough to add a touch of exitement. I used to use a metallic strainer, many years ago, and gave it up for the reasons that you mentioned; I've since adopted the little clay fellow shown in the image, which came from Yunnan Sourcing. As with all of these bits of teaware, you could probably buy it from many different places - the same articles seem to crop up all over the place! The actual strainer is muslin cloth, which makes it very easy to replace. While it takes about a year to clog up, replacements are cheap and easy: just have a piece of muslin cloth handy, and cut a tiny part out of it each time that you want to replace the strainer. It is fixed in place by a piece of cotton, wrapped around, which sits in a special groove. It's very straightforward. I rather like using muslin cloth, because it reminds me of my mother and grandmother making jam using similar apparatus in my childhood. The feeling of the metallic strainer, apart from the rust, is not something that I like, either. It feels a bit "tinny", rather nasty. The clay strainer is charming, in that it darkens with age, like your pots! Thanks for the info ... maybe I'll look into picking one up to try. I can send you samples if you want. I'll send you a message and we can work something out.